In 2010, the Dallas Police Department launched iWatch Dallas. iWatch Dallas is a mobile application designed as a community awareness program that educates the community about suspicious activities & criminal behaviors. iWatch Dallas focuses on criminal behavior and criminal enterprises that could also indicate a nexus to terrorist activities. 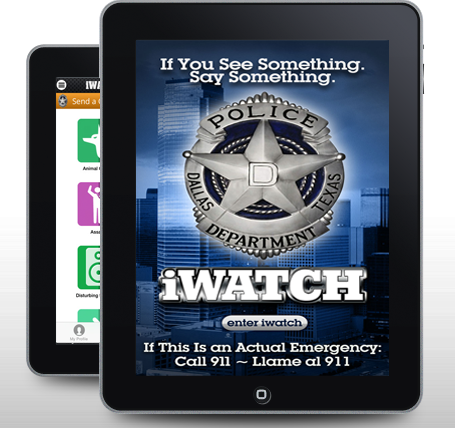 The iWatch Dallas app is a virtual crime watch that you and your neighbors can use to report behaviors and activities that makes you feel uncomfortable or do not look right while remaining anonymous. The mobile application enables citizens to turn in tips, images and videos about crimes or suspicious activities directly to law enforcement from almost any mobile phone or PC. iWatch Dallas also allows you to check Crime Maps on your smart phone. Simply enter an address into the map, and instantly iWatch Dallas will display the crime map for the location of your choice. Like traditional neighborhood crime watches, you are the eyes and ears of your community and your awareness of suspicious behaviors and reporting it to the police can help solve and/or prevent crimes. Use iWatch Dallas, it’s free to use, free to download, and free to sign up. To sign up, click on the link below. ALWAYS CALL 9-1-1 IN AN EMERGENCY OR IF A CRIME IS IN PROGRESS.